Interesting reports and it's nice that the press is doing stories about the life in the soil. Imprelis herbicide was the Poison of the Week on our website last year in July of 2011. Click on this link to read the information from a year ago. Andrew Spear for The New York Times. 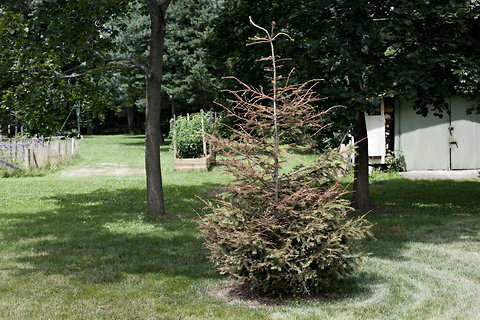 A dead evergreen, apparently killed by the herbicide Imprelis, in Janet and Robert DaPrato’s yard in Columbus, Ohio. The couple says they lost two trees last year and that two more have died since. A year after it became clear that a new and highly touted lawn herbicide called Imprelis was killing and damaging many thousands of trees around the country, the manufacturer, DuPont, is busy processing claims for compensation. 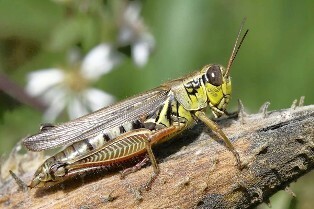 The chemical composition of a dead grasshopper influences the microscopic processes below ground, study finds. And those chemicals are influenced if it's not at peace. The next time you kill an insect, you might want to do it quickly - for the sake of the environment.